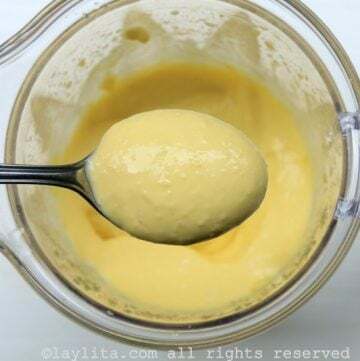 This is an easy recipe for making aioli in the blender or food processor. 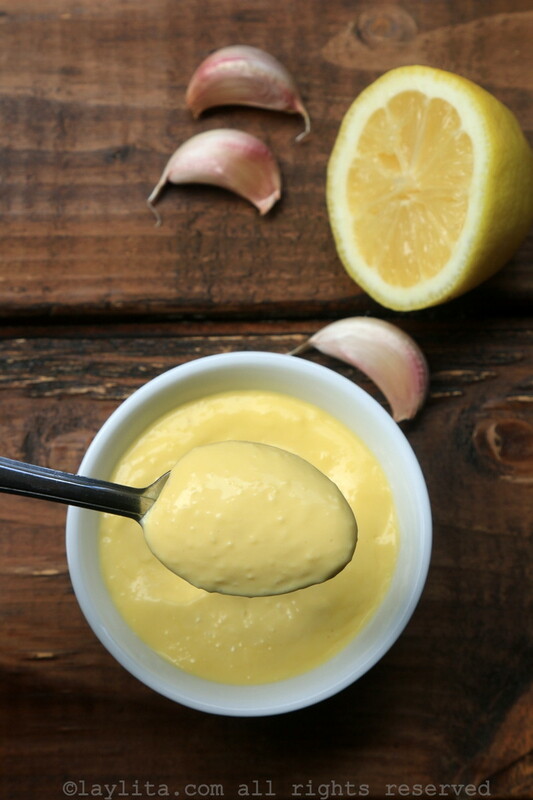 Aioli is a garlic olive oil mayonnaise sauce that is popular in France and Spain. I previously shared my husband’s traditional aioli recipe. He makes it by hand and it’s delicious but requires a good amount of work and patience. I started making this easy version in the blender – it’s great for those times when you need a last-minute sauce – or have a craving for some garlicky deliciousness. In the south of France there’s a whole meal planned around the aioli sauce. 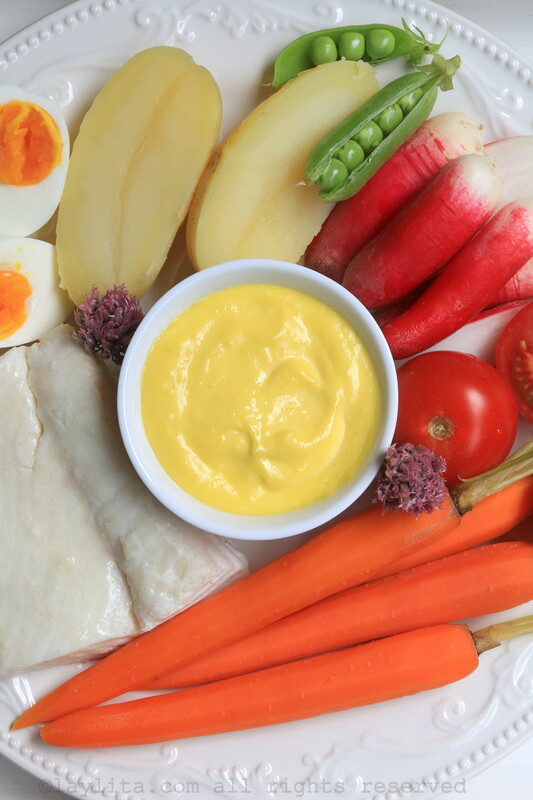 The exact components vary but will generally include boiled eggs and potatoes/carrots, poached or steamed fish, mussels, shrimp, and other seafood. 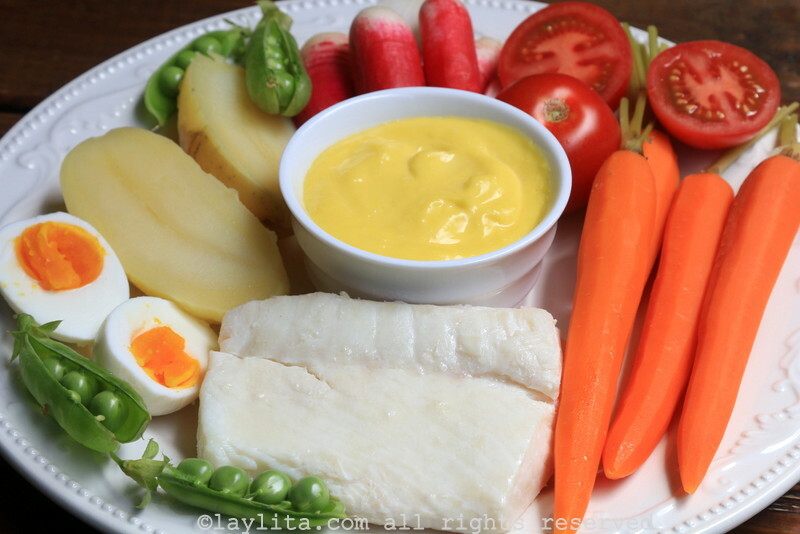 The aioli platter can also include fresh seasonal veggies like tomatoes and radishes. For family get togethers we make a double (or triple batch) of this aioli in the blender – or food processor. It’s a lot quicker than making it by hand. I also serve aioli as a side for baked potato or sweet potato fries. Actually, it goes great with any roasted veggies: Brussel sprouts, cauliflower, carrots, turnips, etc. 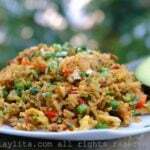 It pairs great with any type of fried seafood, as well as grilled chicken. It can also be used in pasta salads – especially if you want a garlicky kick-, and on sandwiches. 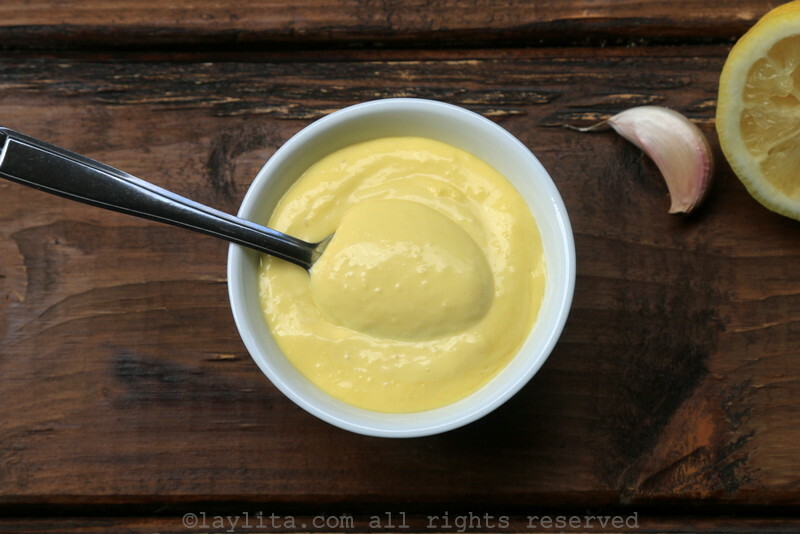 Traditional aioli uses olive oil, but I find that the flavor of olive oil can be overpowering in the aioli. So, depending on what I’m serving it with, I will sometimes use a light olive oil or use a mix of regular extra virgin olive oil and a more neutral oil – avocado oil is my current favorite. 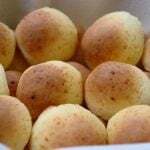 Another difference is that the traditional version uses only egg yolks, but I use one whole egg + one yolk. I find that the whole egg helps bind the ingredients better. This means there’s less likelihood of the aioli breaking apart or not emulsifying properly. If for any reason the aioli doesn’t start to thicken, after adding oil slowly/lending, one way to attempt to fix it is to add another egg. It also helps if the eggs are room temperature. You can adjust the amount of oil depending on how thick you want the aioli. Keep in mind that it will get thicker and more consistent if you refrigerate it for a couple of hours, so ideally you want a creamy texture when done blending. This is another difference between blending and making it by hand – it gets that thickness without the wait when making it by hand. I recommend trying both methods to see which you prefer. 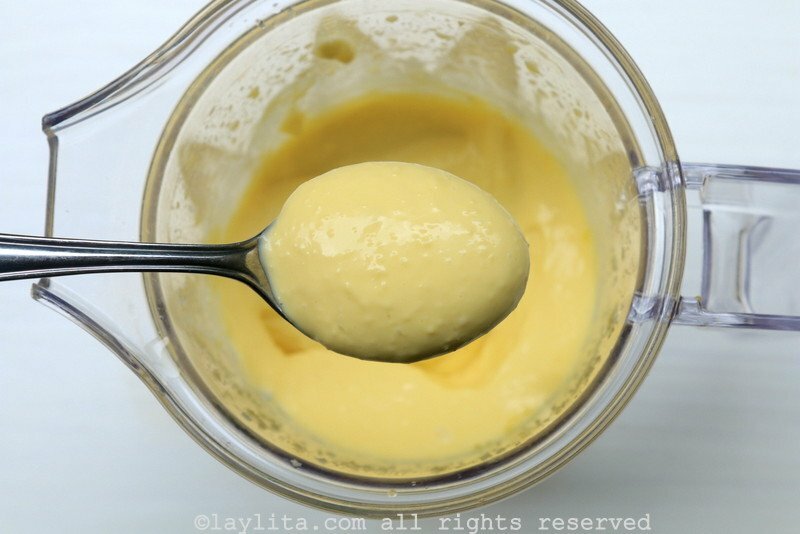 Easy recipe for making aioli in the blender or food processor. 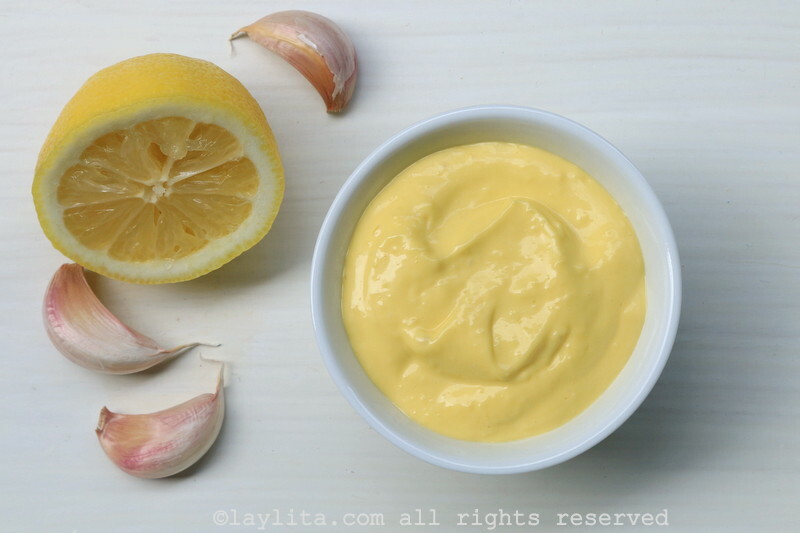 Aioli is a garlic olive oil mayonnaise sauce that is popular in France and Spain. Combine the egg, garlic, some salt and a couple tablespoons of oil in a blender or food processor, pulse until mixed. Continue blending and add the oil slowly until the aioli begins to thicken. Add the lemon juice and additional oil, continue blending until you reach the desired consistency. Towards the end it should blend very slowly o barely at all – the aioli will also thicken even more when refrigerated. If the aioli doesn’t start to thicken, after adding oil slowly while blending, one way to attempt to fix it is to add another egg. Hi Diane – I would recommend using it within 1-2 days (refrigerated).